Today the world was rattled as violence entered Boston's streets and the worries of people all around the world. The triumph of personal achievement was instantly overshadowed by fear, sorrow, injury and even death from explosive devices on Boylston Street near the Boston Marathon's finish line. Tonight many people lie critically injured in hospitals. At least two deaths have been confirmed. The first announced death was that of an eight year old boy. This just shouldn't be. He was eight. Eight. As we reach for comfort and guidance often prayers, songs and poems help lead us through these tragedies. My thoughts often turn to the prayers and songs of my summer camp days - carefree days this little boy will not have. One song - a round - has been sung around many campfires, schools, religious gatherings and music classes. This little boy may have sung it. As trivial as it may seem I want to sing it tonight in his honor. His life was not in vain. His death won't be either. We will somehow become a stronger culture because of him. The words of this song vary from website to website. At camp we sang the last line as, "pledging their lives for peace." 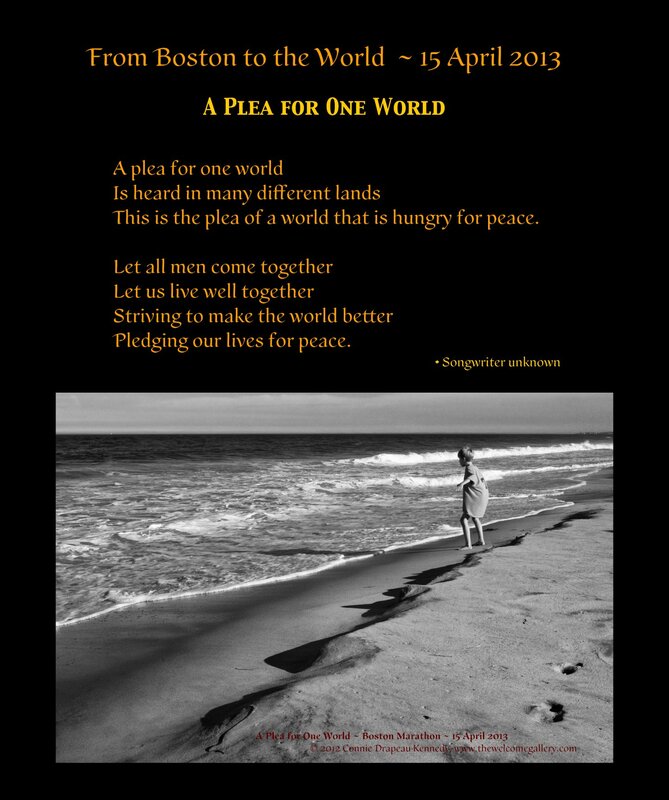 In this version I opted for, "pledging our lives for peace," as it's a pledge we each must continually renew. God bless the first responders, the second responders, the onlookiers, families, friends and strangers writhing in pain tonight from injury or sorrow. Bless the many personal, spiritual and therapy workers who will help today's victims in days and years to come. We cry with his family tonight. Let's all renew our pledge for peace. Peace in people's hearts, in our families, in our nation and in the world. Peace be with you. I ask my Camp Jeanne d'Arc friends and all friends to pledge for peace. In other areas of the world this kind of violence is more commonplace. The peace we need must not just be our own. Pray for and pledge peace for all. Joan Skelton Smith - I also remember this song from my days at camp; I often feel that it had a large impact on my view of the world. It is important now more than ever to renew our efforts to unite the people's of the world in "striving to make the world better, pledging our lives to peace". Connie Drapeau Kennedy - Incidentally, this is not the little boy who was killed by the Boston Marathon's explosives. This cute little guy was on Humarock's beach in September 2012 two days after a significant coastal storm. The loss of life at the hands of Mother Nature is bad enough. To lose it innocently as the work of another human is unfathomable. Rest in peace, Martin Richard. May we all bring comfort to your family and the world.